This evening I decided to make dinner that used up some of the ingredients I had available. 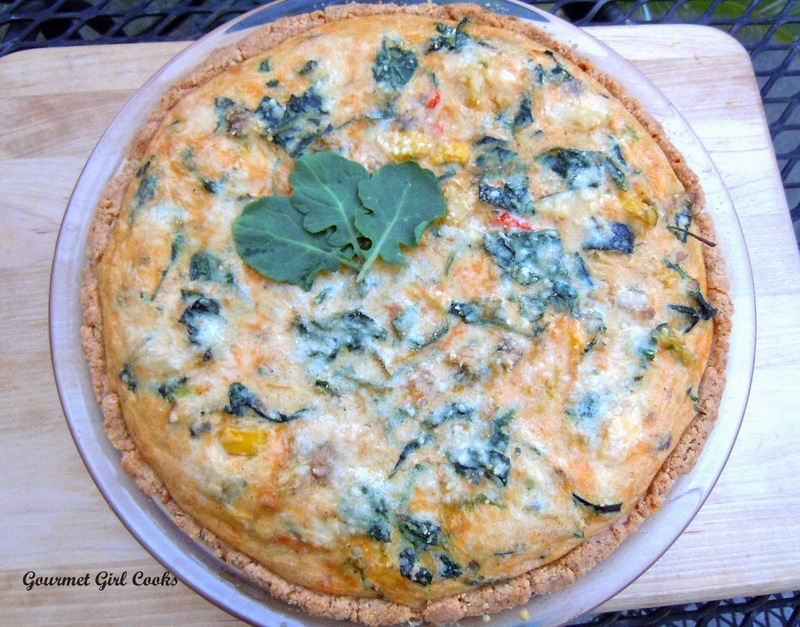 I decided to make a quiche-like pie using baby kale and to give it a Southwestern theme. I had an 8-ounce container of fresh organic baby kale that I sauteed in a little olive oil for a few minutes until it was wilted and then tossed in some sliced green onions and fresh mushrooms and cooked a couple more minutes until tender. I had about 1 cup of leftover squash medley (zucchini, yellow squash and tomatoes) from the other night that I tossed in to the pan with the cooked kale to heat slightly. I made an almond flour pie crust and added Chipotle chile powder to make it a bit spicy. I also added Chipotle to the egg mixture, as well as some sharp cheddar cheese. It turned out really good. As soon as I pulled it out of the oven, it looked like a storm was coming up really fast, so hubby and I decided to get our walk in first and then eat dinner afterwards. We got an hour walk in before dinner and it was so nice to just come in and sit down and eat when we came in. I snapped a couple photos below for you to see and posted the recipe I created as well. Enjoy! Preheat oven to 325 degrees F. Place all crust ingredients in a medium bowl. Cut butter, egg and Chipotle powder into flour with a dough/pastry blender or cutter until mixture resembles small pebbles and the flour is thoroughly moistened (the same way you prepare a pie crust). Press crust mixture into pie dish or tart pan (I used a 10" pyrex pie dish). Bake for approximately 15 minutes or until lightly browned; remove from oven and set aside. Increase oven temp to 350 F degrees. In the same medium bowl, place the well drained cooked kale and other cooked vegetables; add green onions, Chipotle, lime zest, salt, pepper, cheddar, 2 tablespoons Parmesan, eggs and half-n-half. Mix until well combined. Pour mixture into the lightly baked crust and top with remaining 2 tablespoons Parmesan and bake at 350 F for 15 minutes; lower oven temp to 325 F (so edge of crust doesn't over brown); bake for an additional 15-20 minutes or until filling and eggs are set and cooked . If center still seems a little jiggly, cook an additional few minutes. 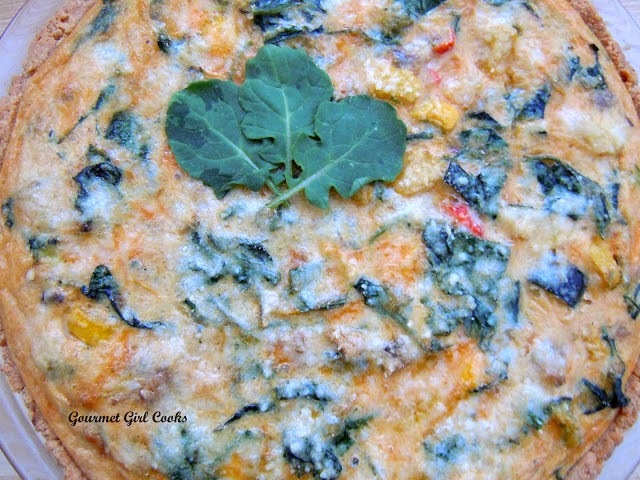 Hi GG, this is on my list, looked so good, I could not find Baby-Kale at Costco , so I have to use the mature one. My husband, the noncook will be in charge of that fabulous pie crust again. Do you use the egg whites (carton) or the whole eggs. I am still scared to use so many whole eggs, all that brainwashing is hard to reverse. Be well and stay well, we need you! Thank you GG for your response. What I am so glad about is that you always answer questions completely, that is so rare these days. Your tip about using a *combi* of eggs and egg beaters is brilliant, do not know why I did not thing of that! Thank you! Last night I spent a lot of time going through your post, what a wonderful collection . Enjoyed the photos, the cabin you visited is out of this world! I hope you can enjoy it again soon! I wanted to read your posts starting July 10th, 2012 but when I entered "blog July 10,2012" it did not lead me there. How else can I do it? Sorry to bother you with this! Be well! Barbara from California.